The seed of the idea for the audio “lunchbox” began in 1966, when Saul Walker started designing modular console components at his company, API. The concept became so popular that some engineers began building homemade racks to house their personal API modules. Out of this, the 500-series lunchbox movement was born. When Walker created the modular “building block” system, he was thinking of a simple way to allow his owners to customize components such as audio preamps, compressors and equalizers into their console. He couldn’t have imagined at the time that studios were soon to dramatically downsize and move into homes, offices and other locations, generating the need for ever more compact and portable audio gear. The API Lunchbox full populated with modules. Click to enlarge. The movement to take modules and move them into portable devices began in the mid-1970s, at first spawning a group of incompatible mounting systems from several companies. In 1985, because of continued and increasing demand, API started making their own standalone Lunchbox-branded racks — in two, six and 10-slot configurations — to house their increasingly popular 500 series of plug-in audio components. In 2006, after the sale and reorganization of the original company, API launched the VPR Alliance, an open-source free initiative designed to implement uniform standards and approve manufacturers of 500 Series components. The goal was to ensure uniform size and voltage standards so that compatibility could be maintained across all 500 Series modules, no matter which manufacturer builds it. Various plug-ins, all compatible with the API Lunchbox packaging. Click to enlarge. Today, 500 series racks and components are a major part of the audio business. There are several key reasons the format has proven so compelling to users and maintains its popularity. One reason is size — there is no other way to get 10 channels of processing into a 4U space. Another is portability. A six-channel 500 series rack that can power two channels of mic preamp, EQ and compressor in an easy to carry package only 13-inches long, 7.5 inches wide and 5.5 inches high is very compelling. As requirements change, having the ability to swap modules in and out and replace a single preamp or compressor with a DI or an EQ creates a very flexible system. Also, the continuing miniaturization of gear has led to more sonic power in less space. What once would only fit into a 19-inch rack can now offer even more processing power on a 500 series card. Finally, the 500 series is popular due to lower cost. Each piece of gear doesn’t need a separate power supply, since the box itself provides a power supply for all the gear plugged into it. That results in overall lower cost. Today, sales of 500 series components have exploded, expanding to more functions, including headphone amplifiers, tape emulation, subharmonic synthesizers, delay lines, effects and even integrated tube-based mic preamps. The standardized VPR Alliance specifications call for voltage at +/- 16 volts with +48 volts for phantom power. Current is spec’d at 130 mA per slot. For circuit designers accustomed to working with power rails up to 24 volts or higher, that voltage spec seemed daunting at first. But problem-solving engineers have met the challenge with an increasing number of 500 series models now available. 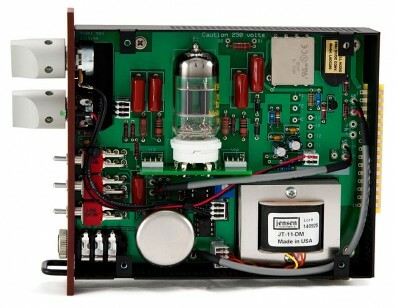 LaChapell 583 tube mic preamp. One area of skepticism is how one can run a tube that requires 250 volts on a +/- 16 volt power supply. It might seem impossible, but the LaChapell 583 tube mic preamp, which fits into a single 500 series slot, does it. Another upside of having a standardized, powered rack is that it allows manufacturers to forego UL, CSA and CE certification for each module so they can concentrate on the audio functions instead of power supply design and certification. Sweetwater Sound, a pro sound dealer who sells 500 series gear, said though the original API racks are perennial best-sellers, some newer racks offer bigger power supplies with capabilities exceeding the 130 mA per slot spec, even up to 400+ mA/slot. Racks such as the RND R6 six-space unit offers LEDs for current monitoring. Some racks even offer dual power supplies (two for +16 volts and two for -16 volts) such as the Fredenstein Bento 10D 10-slot racks. dbx 560A compressor. Click to enlarge. High-quality 500 series cards in the under $500 range are becoming more numerous. 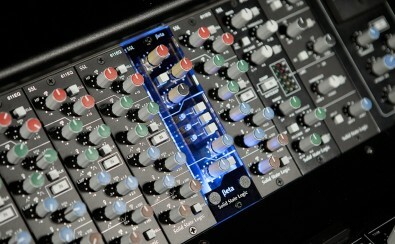 These include the dbx 560A compressor which brings the sound of the venerable dbx 160X into a 500 series box. And several manufacturers, such as Bettermaker and Fredenstein, are now offering USB interfaces and software control for their 500 series modules. These allow control of the hardware modules from a computer or via plug-in interface within a DAW. There’s even a Bluetooth Streaming module now from Heritage Audio that will fit into a 500 slot. As electronics are miniaturized and recording spaces expand to just about any location, 500 series components continue to expand. It is the story of a good idea that grew beyond its inventor’s imagination.